A mainly level site surrounded by mature woodland. The site has been in industrial and distribution use for the last 120 years firstly as a brick works and subsequently as the home of the Tyrell Formula 1 racing team. The site is now occupied by our clients but is unsuitable for modern distribution and production. 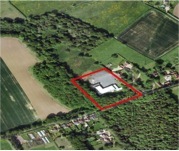 Short Description: A mainly level site surrounded by mature woodland.